In general all mice are acclimated in the mouse rooms where eye examinations are conducted. b. 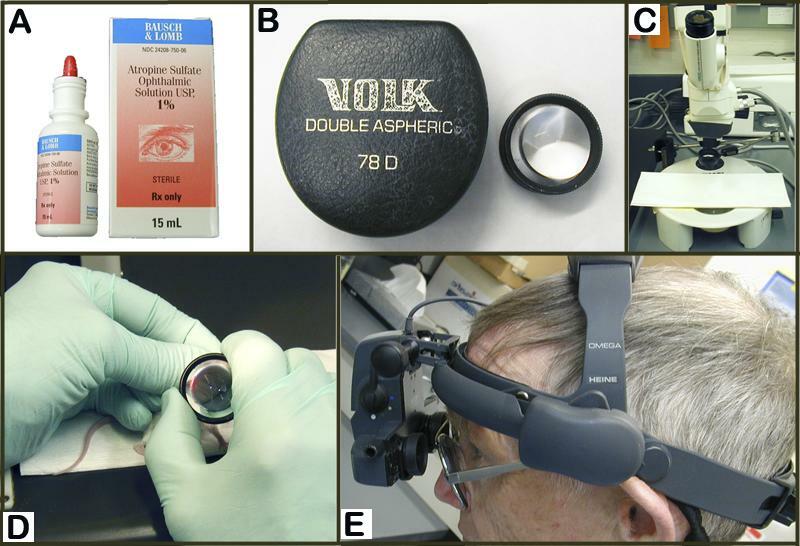 The cornea is examined for clarity, size (buphthalmos vs. microcornea), surface texture, and vascularization using a slit lamp (see Fig. 1, Fig. 4). d. The eye is then dilated with 1% atropine and the lens is checked for cataracts using the slit lamp. 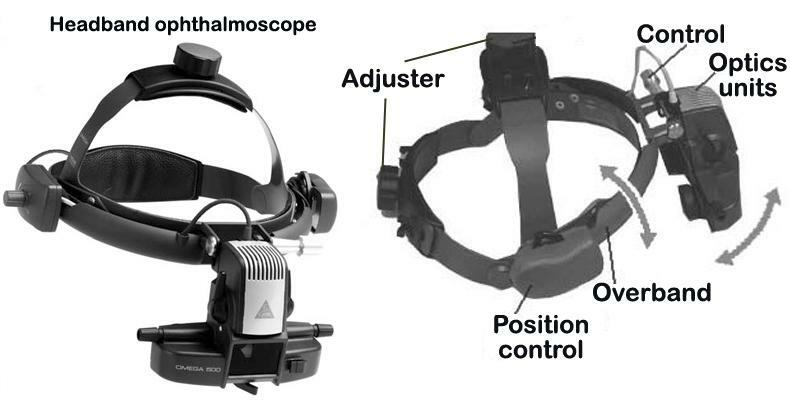 e. Once the eye is dilated, an indirect ophthalmoscope and a hand-held diopter lens are used (Fig. 2 and Fig. 3) to examine the fundus for signs of retinal degeneration (such as retinal vessel attenuation or retinal pigment epithelial (RPE) disturbances), as well as for drusen or deposits or optic cup (nervehead) abnormalities (Fig. 4 to Fig. 7). Cornea: Morphological alterations of the cornea include, but are not limited to, changes in the normal transparency of the cornea (i.e. cloudy cornea, white cornea/corneal opacity), presence of corneal scarring (i.e. corneal spot) or fibrosis and neovascularization (i.e. corneal vessels), and signs of corneal trauma (i.e. corneal tear). Severity can be described as diffuse or focal (small, medium, and/or large spot). See examples in Fig. 4. Lens: Morphological alterations of the lens include, but are not limited to, cataract formations originating from the lens nucleus or lens sutures, aberrant adhesions of the lens to the cornea (i.e. corneal-lens synechia), lens location, and alteration of the overall transparency of the lens fibers (i.e. lens haze, lens snowflakes, lens spot, see examples in Fig. 5). lens cataract: morphologically diffuse or focal alterations in the crystalline lens (i.e. nuclear cataract, suture cataract, snowflake cataract) of the eye or its capsule, potentially resulting in impaired vision, most likely congenital, or idiopathic in origin (Fig. 5). Retina: Morphological alterations of the retina include, but are not limited to, changes to the retinal pigment epithelium (RPE, areas of pigment loss, depigmented spots, mottled), changes in the size of the retinal vessels (i.e. poor and thin retinal vessels), appearance of the the optic disc and nerve (i.e. retinal coloboma, enlarged optic cup), and severe degeneration of the retinal layer (i.e. rd mutations, see examples in Fig. 6 and Fig. 7). alterations in retinal pigmentation: strain-specific variations in retinal pigmentation, may be a component of progressive retinal degeneration, incidental changes in the pigment epithelium (RPE) of the eye, or part of a developmental dysgenesis (see example in Fig. 7). At least some of the same genetic components for retinal pigmentation likely affect coat color, as these two phenotypes are highly correlated. Figure 4. A: Superficial gross appearance of the normal eye and cornea. B and C: Superficial gross appearance of a bilateral corneal change in transparency. D: Small spot with peripheral cloudy appearance of the cornea. E: Large white spot with signs of neovascularization in the cornea. F: Diffusely white cornea with neovascularization and two foci of corneal ulcerations. Figure 5. A: Fully dilated eye showing normal, clear and transparent, lens. B: An example of lens snowflake cataract. C. An example of a lens nuclear cataract. D: An example of a lens suture cataract. Figure 6. A: Appearance of a normal funduscopic examination of the retina. 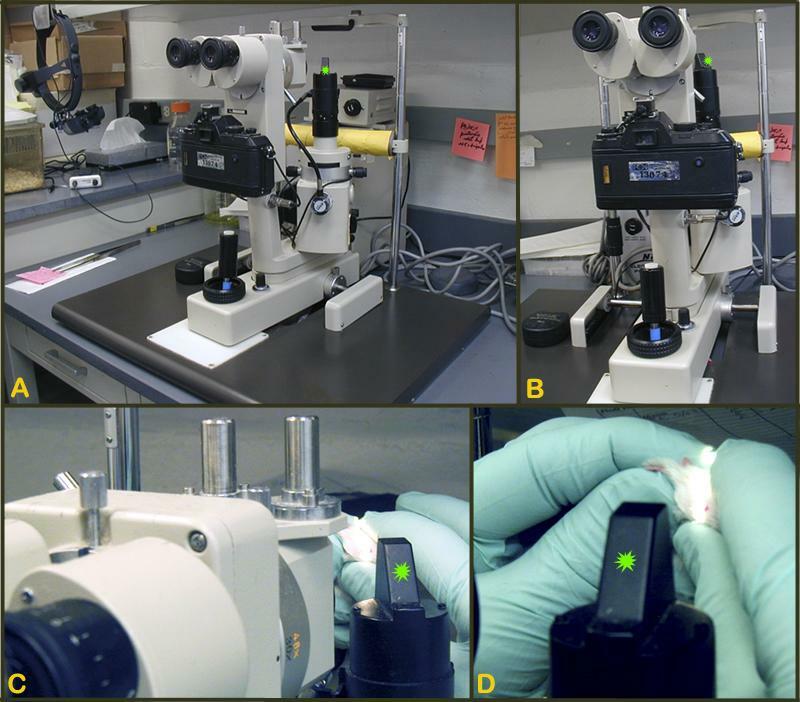 B and C: Examples of advanced retinal degeneration in a pigmented mouse (B) and an albino mouse (C). Note the pronounced mottling of the retina and the attenuation of the retinal vessels compared to the normal eye. Figure 7. A: Normal funduscopic appearance of the retina. B: Example of retinal (punctate hypopigmentation) spots. C: Example of large areas of retinal hypopigmentation (spot). D: Example of moderate areas of hypopigmentation (spots) with signs of mottling. Note the attenuation of the retinal vessels compared to the normal retina in A.